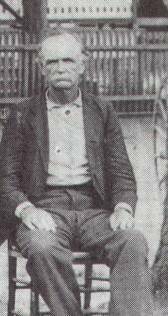 Brown enlisted at Whitmarsh Island in 1864 and served until the war's close. During those hectic days, he served as a private. Sometime during those days his unit was enlisted as infantrymen. After the war he told of marching with his unit hundreds of miles along the coast to Carolina and Virginia until the end of the war. 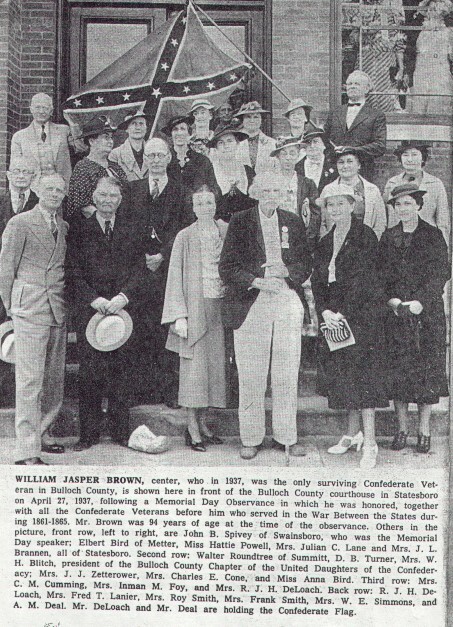 William Jasper Brown died on 2 March 1949 at the age of 103. He was laid to rest in Lake Church Cemetery just outside of Metter, Georgia on Georgia Highway 46 East. His funeral drew a crowd of over five hundred people from near and far. His honor guard was the United States Marine Corp Guard from Beaufort, South Carolina. His funeral attendants were members of the Francis Bartow Camp #93 of the Sons of Confederate Veterans of Savannah, Georgia. 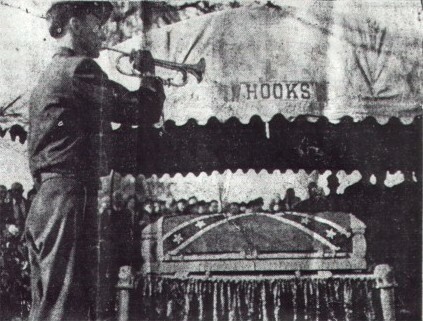 Below is a photograph of his funeral ceremony with a Marine bugler (Pfc. John J. Armeneau) playing "Taps". 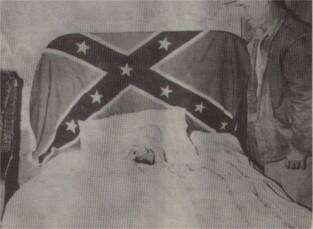 Upon hearing that soldier Brown might not be able to afford a proper burial coffin, one anonymous marine is reported to have donated the coffin you see draped with the Confederate Batle Flag. This photo (above) shows some of the several hundred onlookers who gathered for the funeral in 1949. Among the many dignitaries in attendance was the sheriff of Chatham county who made a few remarks during the service. 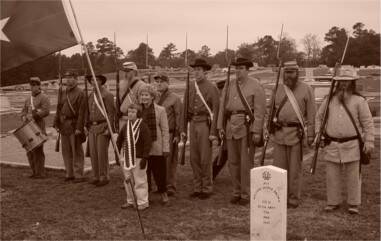 The photo (below) shows the 2001 Confederate Memorial service conducted by the Dixie Guards SCV Camp #1942 honoring Pvt. Brown. 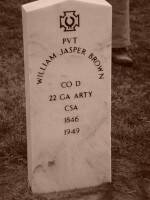 More recently on 14 Dec 2003 Brown's grave was marked by headstone through the efforts of his family with support from the Dixie Guards. 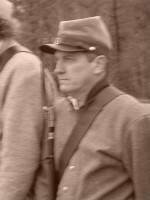 Scroll down for pictures of the ceremony and reenactors. The story of William Jasper Brown was told in a book written by University of Maine professor Jay S. Hoar called "The South's Last Boys in Gray". Click here to buy the book. Click here for an excerpt about that work. Click here for more details on the service records of Pvt. 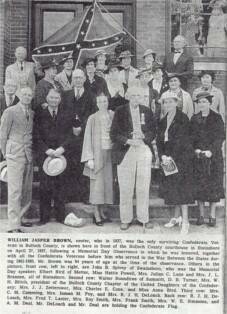 William Jasper Brown compiled by our camp historian. According to an editor’s note published in the Metter Advertiser in the later part of 1992 by Mrs. Virginia Snell, Professor Jay S. Hoar (U. of Maine at Farmington) wrote to the Advertiser via a letter to the editor in January of 1992. In his letter, he requested a picture and any additional info the people of Metter might have regarding soldier Brown. Hoar had previously visited Metter in 1972 to research Brown’s story for his book, The South’s Last Boys in Gray (published in 1986). Snell’s note indicated that the following article, which appeared in the Advertiser, also ran in the Confederate Veteran magazine in 1992. Excerpts of this article were also featured in a compilation on Brown by Ogeechee Rifles historian Smith Callaway Banks that appeared in the 1996 Bulloch County history book called “Spirit of a People”. Jasper Brown was among Georgia’s final Gray triumvirate, a farmer most of his adult life. He was the younger son of Joseph M(anning) Brown, whose dwelling place was between Aaron Station and Garfield. There he grew up to become a tall, tough, blue-eyed lad. 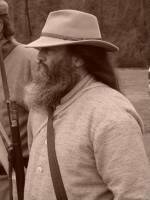 While Jasper helped keep the farm going, his brother Jim went to the War Between the States first. Though details of his own war record are elusive, [See above: 22nd Ga. 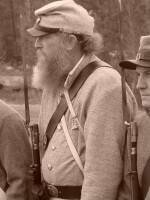 Artillery] Brown was a full 18 when he served eight months with a Georgia infantry unit during 1864-65. Lewis Boatright, an octogenarian living near Garfield In the 1970s, shared these Jan. 21. 1974, thoughts of his old friend. Mrs. Leroy (Sue Nell) Stapleton, who was 69 in 1992, lived in Metter. “Could some person lend Mr. Brown a comfortable wheelchair, for his last days certainly aren’t many.” Oglethorpe Sanitarium quickly donated the chair via a group of U.S. Marines. Though Pheriba (“Aunt Miss”) as she was sometimes known was in a hospital from overwork, the arriving Marines were given a warm welcome by Mr. Rooks. As he led them to Browns bedside, sunlight pierced into the little antechamber between wide boards. 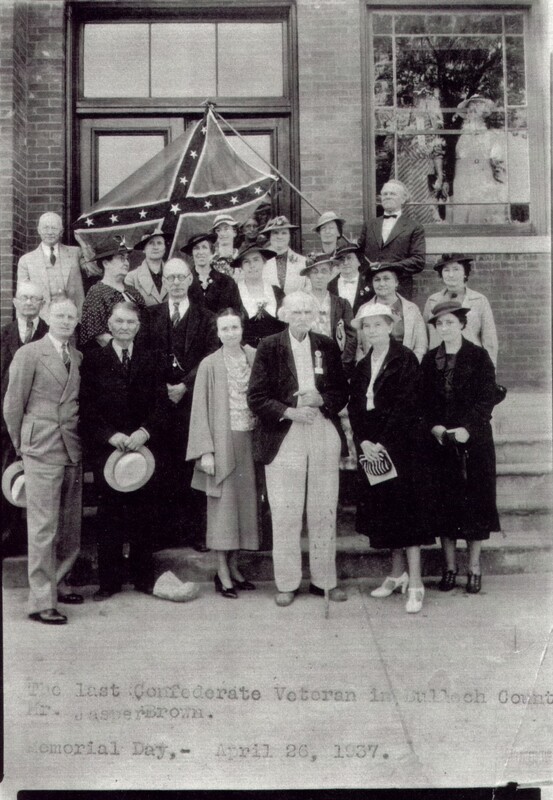 The Confederate flag covering Uncle Jasper’s headboard had its own story. The Rev. F.H. Sills, Candler County legislator and civic groups had responded in 1941 when they learned of the old soldier's request for it. Sills would remember the day he presented the flag. “There were big tears in his eyes when I gave it to him. He was blind then, but he rubbed his hands over the folds and said, ‘I marched many a mile under this flag’. William Jasper Brown clung to life those last four days beyond his 103rd, just long enough for the funds to. be raised. 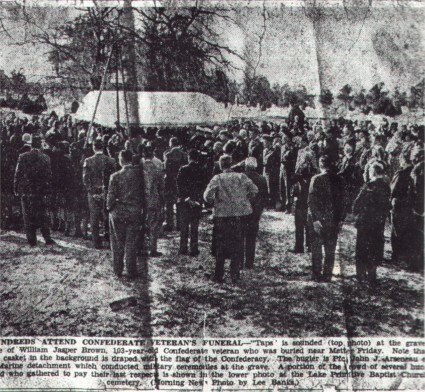 Some 500 Georgians came to his funeral; among them were nine members of Francis S. Bartow Camp 93, S. C. V.
The Savannah Marine detachment gave its comrade full military graveside honors at Lake Primitive Baptist Church Cemetery. It was noted he had been “among loved ones where he had wished to be!’ After all expenses were paid, poetic justice won out when Pheriba Rooks was presented the surplus, a token of appreciation for her excellent care of the old veteran during his invalidism. 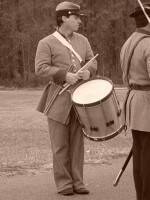 Crotwell-Dixie Guards SCV Camp historian. previously been marked with a Southern Cross of Honor. Pictures and video of that ceremony are posted below. 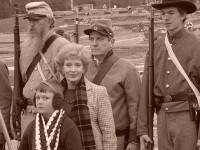 Reenactors from several area camps came to make this a memorable occasion for a memorable veteran. 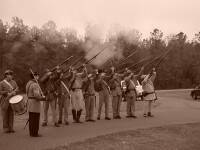 Special thanks go to the honor guard which included members of the Ebenezer Rifles of Effingham, Ogeechee Rifles of Bulloch, and John C. Carter Camp of Waynesboro. Mary Deloach Jones, Urel Sharpe Jones, Dora Jones Walker, William Jasper Brown(nephew of CSA vet), George Walter Brown, Buford B. Jones, Canvancy Dekle Jones Brown, Minnie Jones Rayper, Jasper Brown (CSA vet, uncle of W.Jasper Brown at left). Burkhart of the Ogeechee Rifles is seen showing Matthew McLendon, the 4th great nephew of Pvt. William Jasper Brown, how to hold and fire a rifle. 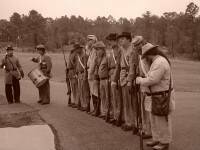 Honor Guard (above) L to R Thad Beckum (Ebenezer Rifles), Steve Burke (John C. Carter), unidentified, Randall Burkhart (Ogeechee Rifles), Paul Burkhart (Ogeechee Rifles), Paul Harmon (Ogeechee Rifles), Adam Bazemore (Ogeechee Rifles), Don Bazemore (Ogeechee Rifles), Jeff Marlow (Ebenezer Rifles), Eddie Cockburn (Ogeechee Rifles). Front middle, 2nd Great niece of Pvt. Brown- Mrs. Pam Griner and 4th Great nephew- Matthew McLendon. 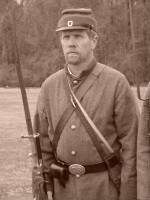 Shown second pic above left (with sword) Brian Beckum (Ebenezer Rifles).